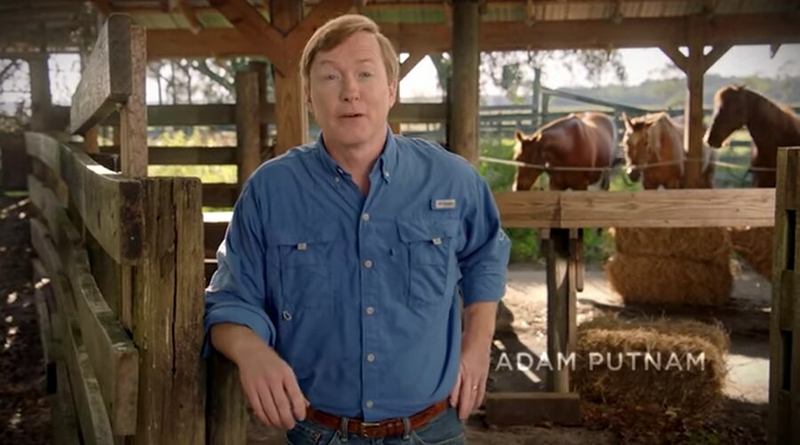 Screen grab from Adam Putnam's first campaign ad which was released April 23, 2018. Credit: Adam Putnam, Republican for governor via YouTube. The Florida Chamber of Commerce has endorsed Agriculture Commissioner Adam Putnam in his race to be the state's next governor. The business group announced Thursday in Orlando it had selected Putnam over his Republican primary opponent, Rep. Ron DeSantis, and the Democratic field. "Adam Putnam is the leader Florida needs to keep Florida's momentum going," said Mark Wilson, President and CEO of the Florida Chamber of Commerce. "Adam Putnam knows Florida best, and I know without a doubt he believes in free enterprise and economic opportunity for every single Floridian." The endorsement bolsters the perception that Putnam is the favorite within traditional GOP circles and the groups they often rely on to help win elections. The chamber recently endorsed Gov. Rick Scott, also a Republican, in his challenge of Sen. Bill Nelson, D-Fla.
DeSantis, though, has mounted an outsider campaign that has been critical of Putnam's close ties to many of the state's most influential industries. Thursday's endorsement by the state's largest business organization won't hurt that argument. "I am proud to have the support of the Florida Chamber of Commerce," Putnam said in a statement. "The Chamber has a long and proven history of supporting businesses across the state, and I look forward to working alongside the Chamber to ensure Florida continues to build on its legacy as the most business-friendly state in the nation."